June 2016: Staplethorne Ltd (in Devon) is selling a range of used R&D X-ray and vacuum equipment. This includes: a 320KV radiation chamber (set up for R&D with 320KV X-ray tube and Ge detectors), Ge & Si(Li) detectors, vacuum pumps, and NIM crate and modules. Please contact xrays@staplethorne.co.uk or Tel: + 44 (0)1404 42455 for further information if of interest. Used R&D X-ray and Vacuum Equipment List. Are you responsible for elemental (chemical) analysis and/or quality control in your organization? If so, you will be well aware of the financial rewards to your organization of using an appropriate and cost-effective solution for measuring what you need to control. 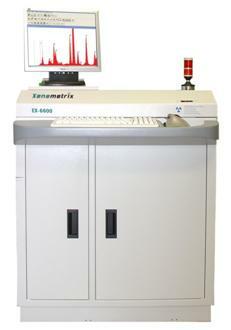 For this reason, we would like to introduce to you the latest in the Xenemetrix (formerly Jordan Valley) range of X-ray fluorescence (XRF) elemental analyzers which are supplied and supported here in the UK by Staplethorne Ltd, who are experts in XRF analysis and X-ray system design for a range of customers. Xenemetrix manufactures an innovative range of high quality energy-dispersive X-ray fluorescence (EDXRF) spectrometers that are setting new standards in performance, reliability and cost-effectiveness. These are used for the non-destructive analysis of the multi-elemental composition of a wide range of materials - rapidly providing essential information to laboratories, process control managers, etc. With increasing demands on quality, and the rising costs of materials and labour, these simple to operate Windows © - based XRF instruments, with their minimal sample preparation requirements, provide reliable answers with a minimum of fuss and maintenance. Flexible and easy-to-use, even by non-technical personnel. Xenemetrix is an established Israeli company, with a major subsidiary in Texas and expert technical representatives throughout Europe and many other trading areas. Staplethorne , their UK representative, is a company that carries out contract technical research, product development, and marketing of instrumentation for non-contacting/non-intrusive elemental analysis as well as designing a range of other sensors and instrumentation. We are also capable of creating specific application procedures and adapting products to meet specific customer needs, and offer UK-based service and support. We can also carry out XRF design and/or analysis projects for you and we are interested in receiving project proposals.